The CU 5905 is the system controller in the DDS 5900 Digital Discussion System product portfolio. It controls and supplies power to the chairman/delegate conference units and interpreter units. 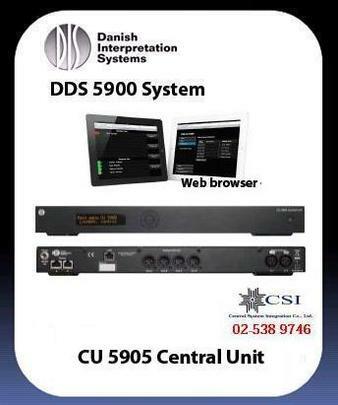 The CU 5905 operates up to 250 conference units and interpreter units in a single bus cable structure known as the DCS-LAN; a proprietary high-speed digital audio, data and power bus. All units are connected to the DCS-LAN in daisy chains using standard CAT 5e (or higher) FTP/STP cables. The CU 5905 features fully digital audio transmission of the floor channel and 2 interpretation channels and up to 8 conference microphones can be open at the same time. The floor channel can be distributed in three different qualities to accommodate for the use with external PA systems. The CU 5905 features 1 analog audio input and 4 analog audio output, The 4 analog output are used for distribution of audio from a single conference unit or from a group of units. The analog output can also be configured for interpreter channel sound for output to language distribution systems like wireless infrared systems. Sound to the built in loudspeakers are either from Out A or from the Analog Audio Input connector. Connection for Emergency Input (EEM) is available as well. The OLED display on the front enables the user to setup basic system configurations in terms of maximum number of speakers/requests, microphone operation mode etc. All system settings are available in a web browser interface as the CU 5905 provides TCP/IP communication to external control over Ethernet. Inserting JB 6104 junction boxes in the DCS-LAN chain enables hot plug of single units. Each JB 6104 junction box features connection of a single unit to each of the four outputs on junction box.